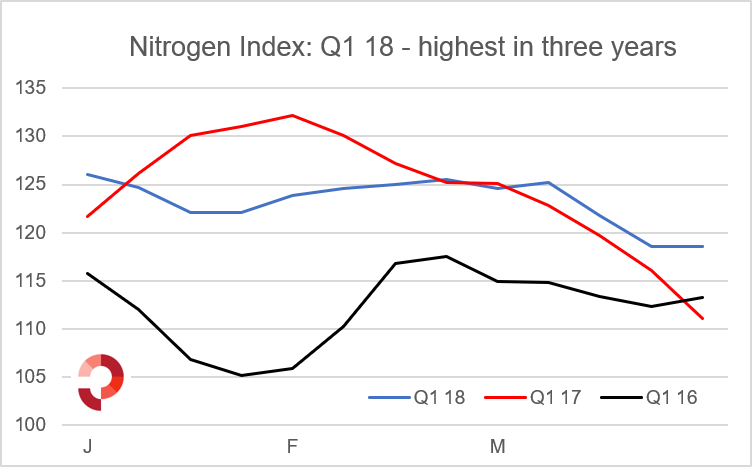 The first quarters of each of the last three years have seen lower prices with a 6-8-point decline on the Profercy World Nitrogen Index. 2018 was no exception. Demand from the East, largely as a result of China’s sharp reduction in exports, meant that the index ended the first quarter of 2018 higher, at 118.52 points, than the year before, at 111.03. The Eastern demand started to fade away during the first half of March and led to prices and the index declining sharply with 6.68 points of the overall 6.55 drop in the index for the Q1 18 coming during the last three weeks. The lows for both Q1 17 and Q1 18 came during the last weeks of the quarters. In 2017, the year began at 121.69 and markets rallied for five straight weeks to a high of 132.16 before sharply coming off. During the last three weeks of Q1 17, the index declined by 11.79. Meanwhile, in 2018 the year opened at a high for the quarter of 126.01 but was far less volatile in comparison to Q117 due to the buying interest in the East until mid-March. The Eastern demand, for mainly Middle East and North African product, came thanks to China’s exit from the international scene. Uncompetitive production costs and government regulation on pollution forced many of the Chinese players to scale back production. On average, Chinese run rates have been at just above 60% of nameplate capacity. Chinese February exports of urea paint a clear picture of the structural shifts in the country. Exports declined by 90% in February 2018, year on year, with a mere 51,000t leaving the country. Once imports are considered, then China was left with a trade surplus of just 6,000t. Chinese exports are now at lows last seen in June 2013, before the lifting of high-export tariffs which limited international trade until enough pressure grew to sell due to product build up at the ports. Pari passu, China’s absence should have led to bullish global urea markets but expectations of demand from Western markets failed to materialise. The US market was set to be the main buyer during Q1. 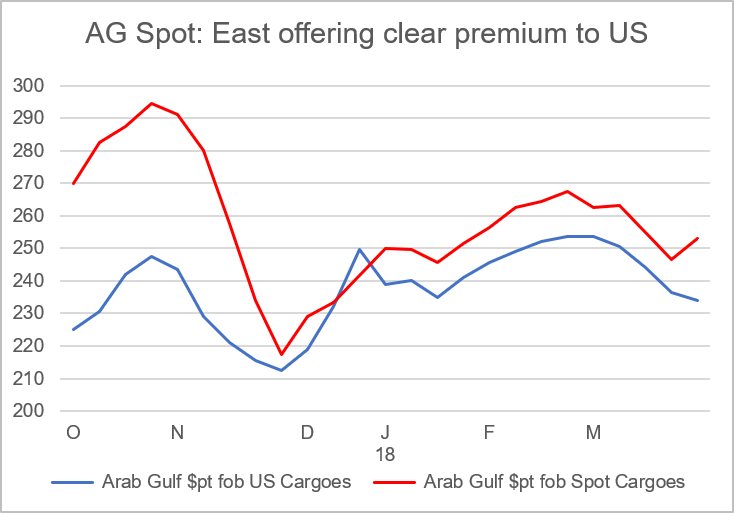 However, US prices stagnated and failed to rise above Eastern markets with the Middle East netbacks to the East offering a premium of between $10-20pt over cargoes to the US throughout the first quarter. Wintery weather in the US led to a delay in the farming season as well as causing logistical problems by significantly restricting barge movements along the key water highways of the Mississippi River. Seasonally, the second quarter of the year is not a strong period for urea demand as Western markets are largely satisfied or long shipment periods from further off suppliers mean the window to get product to farmers in time for the season is closed. There is likely to be some buying from big consumers like India, however, Q2 18 is unlikely to see a break from the usual downward trend. Nonetheless, China’s relatively recent and ongoing exit as a major export player will likely mean that prices in 2Q 18 will be higher than those witnessed in 2017, as was the case in Q1.